Extreme weather conditions, ranging from the heat of summer to the wetness of winter, can have devastating impacts on gates and fencing structures. As winter approaches, it is important to realise that the cold and constant moisture from the rain may damage your existing fences and gates. Rain can accelerate wood rot (if you have timber fencing), rust (if your fences are not made from treated steel) and damage the alignment of your gates. The hassle of this can be avoided if firstly, your existing structures are strong and made from high quality materials. At Fencemakers we only work with treated steel and aluminium for this reason. 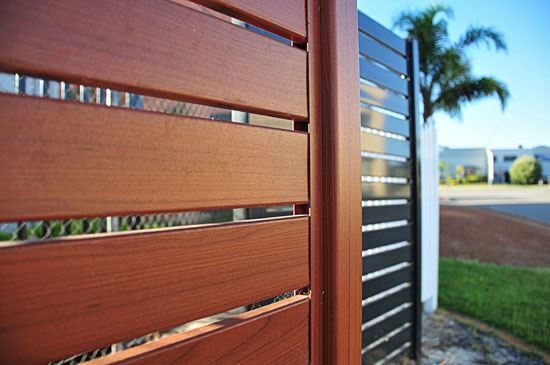 Even our timber-look fencing is actually made from aluminium coated with a smartwood finish. However, if you do come across problems or warning signs in your fencing or gates, repairing these issues before the change of the seasons will prevent the problem from getting any worse. If you do let your fencing fall into a state of disrepair it opens your home up to all kinds of risks. Intruders may be able to get in and small children or pets may be able to get out. If your fence is in place for aesthetic reasons, then this can also be damaged by rain and dampness. Areas of separation amongst posts and misalignment can affect the functionality and structural integrity of your gates and fencing. These problems can cause safety issues when it comes to children and pets, as well as keeping unwanted intruders off your property. Stagnant water that sits at the base of your fencing can also cause damage to the strength and stability of your structure as it will soften the ground in which it is anchored. If need be, you can either reseal the base of your posts or even replace your fencing with a stronger and sturdier version: this will allow for the structure to stand strong against the harshness of the coming winter. Time, consistently wet weather and general wear and tear and can result in the bases of your fence posts losing their stability. Unstable bases can cause many problems as this makes it easier for intruders to get in, as well as for children and animals to get out. Even if your fence has been erected for aesthetic purposes, these can be marred by your fence leaning or even completely falling over if the base becomes loose or unstable. Before the wet winter arrives, it is important to check the strength of your fence posts: make sure that they are solid and that they are standing straight in the ground. Take the time to check the soil or land around the base to see whether it is solid, dry and has not sunken in. If you are not satisfied, it is worth your while considering a replacement of the fence posts, or calling in us to see what we can do to fix the issue. Cracks, rotting and rusting are all caused by your fencing and gates being exposed to wet weather conditions. This is especially important when it comes to your gate as this can halt the functionality completely. You may need to reconsider the material that you are using, especially if it is wood, as this is more prone to rotting and cracking. A great alternative to wood is smartwood: this allows you to keep the aesthetics of a timber or picket fence, but heightens strength and functionality of your fencing as it is actually made from coated aluminium. In terms of steel and aluminium, or other types of fencing, you can apply a protective layer of wax in order to ward off rusting. Tarp covers can also protect your fencing from rain, however, this may not be feasible to maintain during long, wet winters. Painting iron fencing can protect the iron from air oxidation, thus reducing the likelihood of rusting as well as enhancing the way that the fence looks. Also remember that the hardware used for your gate must also be protected from rust, as this can seriously damage your gate and make functionality limited and difficult. It may be wise to double check all your gate hardware, such as screws, latches, hinges and nails: You may find that these are plagued by rust or are disintegrating due to wear and tear. Replacing them all before winter will ensure that your gate will not suffer any problems from the cold and rain. Winter is a reality for all and it can cause huge problems for homeowners. This is why it is wise to take the time to assess your current fencing and gate structures. They may simply need a tweak here and there, or you may find that they need to be replaced completely. For the safety of your loved ones, it is of vital importance that this aspect of your home is in order and able to endure the coming winter. There are a variety of options available for replacement materials, from steel and metal aluminium, to smartwood. Gate hardware is easy to come by and the installation process is simple: so, take the time to assess what needs fixing or replacing, and if you feel as though your fencing requires repair or replacement then don’t hesitate to get in touch with our helpful sales team.